While the following will pertain to all styles of hammocks, we are focusing on the popular parachute nylon camping hammocks. There is also no magic bullet for setting up the perfect hang. An ideal hammock setup for one person may feel cramped and uncomfortable for another. When getting started, don’t be afraid to experiment with the length, angle and slack you have your hammock at until you find one that is right for you. 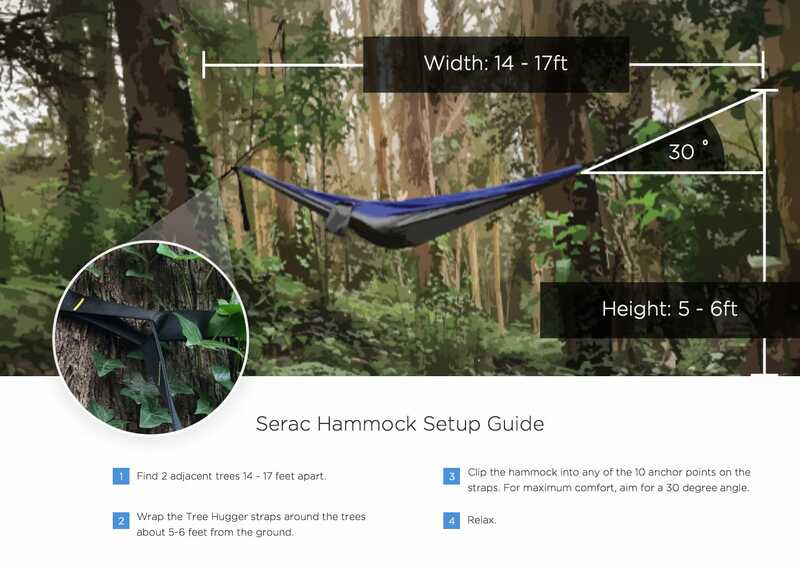 Below you’ll find our recommendations on how to set up your Serac Camping Hammock. The first step is to find two trees separated from one another by roughly the length of your hammock. Make sure you are using straps on the trees. Simply tying a rope around the tree is an easy way to damage the tree by concentrating all the weight on a small strip of surface area. Keep in mind the thickness of the tree trunk, your straps may not be long enough to completely wrap around the trunk. Wrap your tree straps around the trunks of the trees, feeding one end through the other. As you tighten, adjust the height of the straps so that they are on the same horizontal plane. If you’re on a slope, that may mean that one strap needs to be higher on its tree to maintain the horizontal plane. Next simply clip into the daisy chain of the hammock straps. You may want to adjust the slack of the hammock to find a setting that is most comfortable for you. Some people prefer to have the hammock hung loosely, providing more slack to move around in the hammock while others prefer their hammocks taut with the sides cocooning them. Be aware of your surroundings when setting up the hammock. It’s tempting to find the most spectacular location to hang from, but remember that accidents can happen when we least expect them to. If you are planning to sleep and stay in your hammock for hours, make sure you find a spot that you wouldn’t mind landing on in the off case you flip over or the hammock rips. Remember – only hang as high as you are comfortable falling.